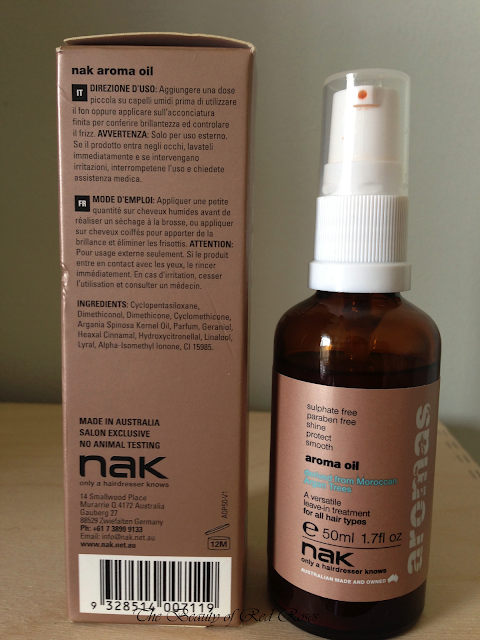 NAK Aroma Oil with argan oil is my miracle hair treatment product that I cannot leave the house without! I was really intrigued to try this leave-in hair treatment when I read that the core ingredient of this product is Argan oil. Argan oil has many benefits as it helps to restore damaged hair, combat frizz, add shine and protect the hair from heat styling. Other key ingredients include Lavender, Patchouli and Geranium, now that sounds absolutely divine doesn't it?! I could really sense the delicate lavender and it makes the overall scent of Aroma Oil just uplifting and beautiful! For me, only one pump will suffice to apply on the lower half of my hair, so a little goes a long way. The consistency of the orange tinted liquid is slightly thin which makes it really easy to evenly distribute and it also absorbs fairly quickly too. Surprisingly, being an argan oil-based hair treatment, my hair didn't feel weighed-down nor greasy. Not even my hands felt greasy or icky after application! After one week of using NAK Aroma Oil on a daily basis, my hair seems to feel naturally silky smooth and more manageable! 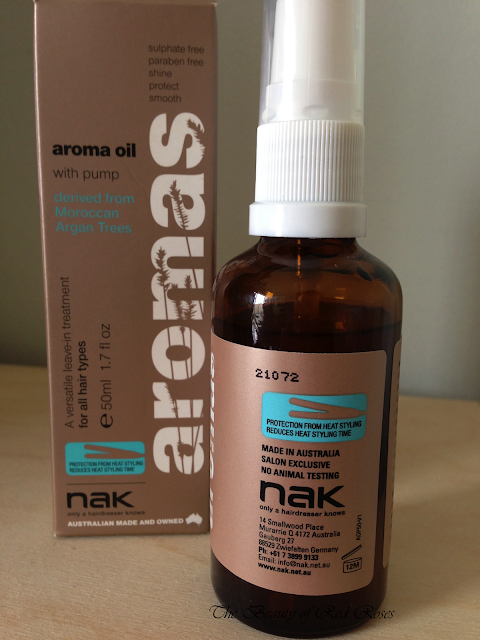 NAK Aroma Oil instantly tames fly-aways, and adds lustre and moisture to my hair, while in the long run this amazing Aroma Oil has given my hair vitality, vigor and vibrancy! 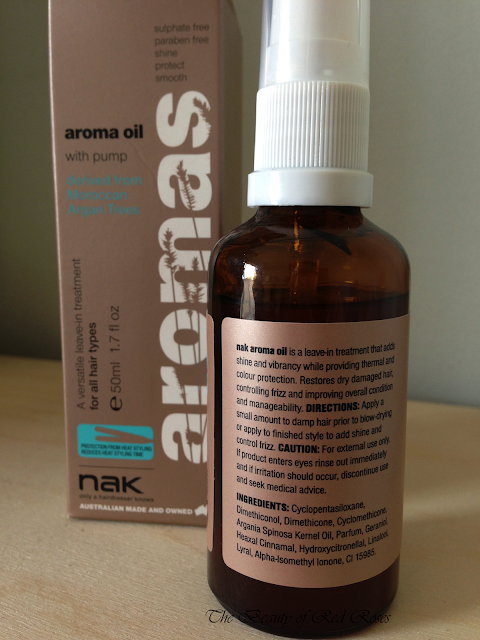 NAK Aroma Oil is free from sulphate and paraben, and is not tested on animals. NAK Aroma Oil (A$24.95/50ml, A$39.95/100ml, A$59.95/200ml) is available at Buy Haircare Direct online, Hairhouse Warehouse, Price Attack and selected professional hair salons nationally. Have you tried argan oil-based hair treatments? Have you tried any products from the NAK range? Product was provided for consideration only. This review is 100% based on my own thoughts and opinions. I am not affiliated with NAK Hair and did not receive remuneration to post this product review. Love the feeling of smooth hair! I'm using Redken Argon Oil which is really nice. I also have NAK Aromas Leave-In moisturiser. 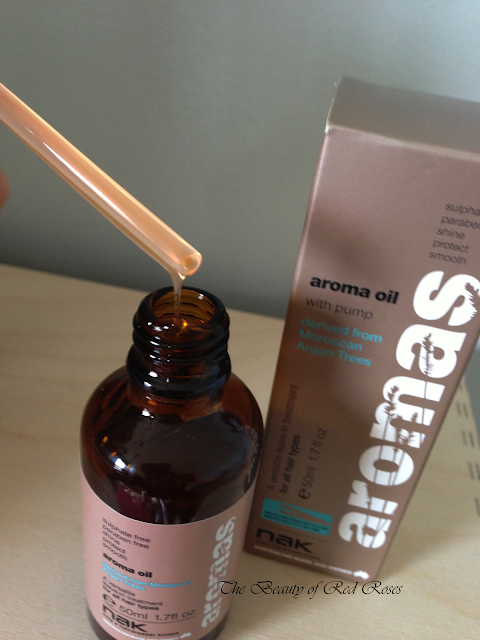 The Redken Argon Oil sounds nice and so does the NAK Aromas Leave-In Moisturiser!